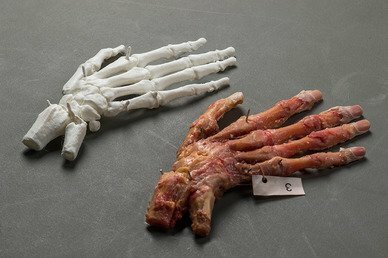 Until very recently, it was unclear how a 3D-printed model of a human bone related to an actual human bone in terms of accuracy. It was assumed by many in the field that the accuracy was comparable, but this had not been confirmed. For two main reasons, it is very important to know if both human bone and 3D printed modes of bone are virtually the same. First, when performing an operation, surgeons are not able see all important anatomy during the operation. We instead use our sense of touch to feel parts of bone, which are covered by fascia, fat, and skin. It is important that a 3D-printed model be exactly the same shape as what is actually inside the body. Furthermore if pre-bending plates on 3D-printed models to implant them in the body, one must also be sure that the shape of the 3D-printed model is exactly right to work with an individual human bone; otherwise, it will not fit. To validate our process in making 3D-printed models, my colleagues and I performed a study in which nine specimens were scanned, volume rendered into 3D reconstructions, and saved as STL data. All models were in a ratio of 1:1 and printed on the Ultimaker 3 and Makerbot Replicator Z18. Two independent observers measured all distances between the K-wires on the human cadavers, 2DCT, 3D reconstruction, Meshlab and both printers. We found that our 3D-printing process resulted in accurate models that are suitable for preoperative workup. The Ultimaker 3 was slightly more accurate than the Makerbot Replicator Z18. We advise that medical professionals perform their own studies to test the accuracy of their own 3D-printing processes before using 3D-printed models in medical practice. Read the full study, published in the European Journal of Trauma and Emergency Surgery. Amazing article!! This is really helpful who want to work in 3d printing technology firm or rather in working in this firm.